Player Watch #36: Joel Crocker - Recruited with selection 69. Welcome Joel! Joel Crocker has endured a challenging past year. A serious ankle injury in week one of the Dragons’ finals campaign last year saw the North Melbourne father-son prospect miss the entire pre-season. Then, after showing strong form in his school football return for Brighton Grammar, the 191cm utility injured his other ankle at training, which ruled him out of the season. Despite limited opportunity to impress, Crocker hasn’t wasted a moment, managing five games as a bottom-ager in a star-studded Dragons line-up in 2017, before dominating school footy in early 2018. Joel’s father Darren played 165 games for North Melbourne over a 14-year period, also struggling with injury throughout much of his AFL career. But like his father, Joel has the rare ability to play almost anywhere on the ground, making him a valuable utility. He’s played on the wing and as an outside midfielder at TAC Cup level, while he was often deployed at full-back for Brighton Grammar in 2017. Interestingly, in 2018 before injury struck, Crocker played an inside midfield role at school football level, as well as playing out of full-forward. This is perhaps where Crocker’s talent has been most outstanding, having combined five goals with 26 disposals in a dominant Friday night display against Caulfield Grammar early in the season. Crocker has opportunity to further display his agility and athleticism at the national combine in early October. Crocker’s versatility stands out at his greatest strength. While predominantly described as a hybrid defender, Crocker can provide run and class from a wing, play out of full forward, act as a key defender, and even convert into an inside midfielder. Described by teammate Kai Owens as a “good silky player with good composure,” Crocker’s class, agility and athleticism blend to make him a difficult matchup. Crocker’s attitude is also a notable feature. His ability to perform roles in any position on the ground is a rare trait, but his resilience and determination in overcoming a pair of ankle injuries can’t be ignored. Made his return to school footy without a pre-season in fine form, while his commitment remains strong despite being ruled out of the season with an injury to the other ankle, which required surgery. At just 73kg, Crocker simply needs to put on more size. Though chiefly an outside player, Crocker’s ball-winning ability will be further challenged next year playing against men at VFL or even AFL level. The 191cm prospect has also been seen as a third tall in defence but will need to add to his currently light frame in order to perform such a role. The most obvious question mark at this stage, however, surrounds Crocker’s durability. Having managed just a handful of games in the past year, he’ll need to find a way to help prevent further serious injury. If not for injury, Crocker’s talent might have seen him discussed as one of 2018’s top prospects. However, this could see the utility prove a late bargain in the draft, provided he can solve the issue of his troublesome ankles early in his career. North Melbourne — where father Darren works as a Director of Coaching — will likely select him as a father-son pick, while glimpses of his talent, in a handful of positions, should also attract interest from other clubs. POTENTIAL North Melbourne father-son pick Joel Crocker was one of Vic Metro's best players in its under-17s clash with Vic Country last weekend. The son of 1996 Roos premiership player and current director of coaching Darren, Crocker had 15 disposals and impressed with his marking, taking nine grabs switching between roles in attack and defence. The 188cm prospect has focused on playing at school level this year, but has spent time with North Melbourne as part of its father-son program ahead of being eligible for the draft next year. He is one of at least three father-son prospects up for grabs for the club in 2018, alongside (he who shall not be named) and Bailey Scott (the son of Robert). AFL has been a monumental part of Joel Crocker’s life. From a young age, Crocker has been exposed to the rigours of life at the elite level, learning from his dad former-North Melbourne player and current assistant coach Darren Crocker. Crocker says his dad’s involvement in the AFL has provided him with unparalleled experience of what it takes as he approaches the National Draft. “I have been around AFL players from a young age and getting to see what the environment is like … it has been a good experience,” he said. Similar to his father’s career, Crocker’s footballing journey has been injury-ravelled. After just his second game back and at training for Brighton Grammar, Crocker injured himself again. “I was kicking the ball and my foot landed in a bit of a ditch … there was no contact or anything just me kicking and there was a bit of a hole that I tripped into,” he explained. “I wasn’t sure of the damage at first but I got scans and it revealed I had done the same thing but on the other ankle.” It was an injury that would stop him playing his top-age year of TAC Cup football. Despite missing the season, in Crocker’s limited game time at both TAC Cup and APS football AFL recruiters saw a shining light and he was recognised with a National Combine invite. Crocker said the invitation came as a relief. “I was hoping that I had done enough in my games last year and at school footy this year but I wasn’t too sure so it was good to see that there is still a bit of interest in me but I will have to wait and see at draft time if my name gets called out.” Kornberg agreed that Crocker had shown enough in his bottom-age year to impress recruiting staff. Although he loves North Melbourne and said it would be “pretty special” to hear his named called out by them come draft night, Crocker said he simply “hopes” to find himself on an AFL list. Joel Crocker (U16 Blacks) has been selected on the School Sport Australia Under 15, All Australian Team. Joel with his team mates will be heading to South Africa as part of his selection. 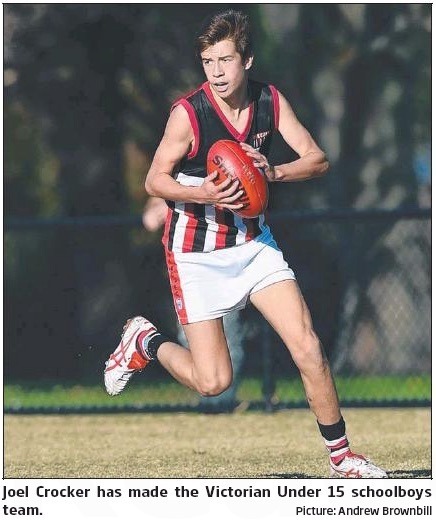 St Kilda City JFC wish Joel the best of luck. Genuinely think he would have gone top 20 with an injury free run at it this year. The ankle was a blessing in disguise for us. Nek minnit WCE invent bionic legs and take him from under us. His old man would've been a 300 gamer if his body was more resilient. Absolute heart and soul type and tough as nails - played both 1994 finals with a broken jaw. He kicked a massive momentum-swinging goal in the third quarter of the 1996 GF. It was one of the loudest roars I've ever heard from a North crowd. KangaTech shares will go through the roof when we get Joel right. In the mid to late 90's when we were the big boys, Denis Pagan stated that Darren Crocker was in his top 6 players. Was great when he came back from injury setback to play in the forward line. Very underrated overhead, and a good luck at goal. I think he and Craig Sholl really combined well with Carey as alternate targets. Been a long time since we were the team to beat. Is it true we have the longest streak since playing in a grand final? A seriously smart footballer, and it appears his son has inherited that trait. How hard is it to recruit a future premiership coach?